With the British marching into Philadelphia on September 23, 1777, General George Washington looked for an opportunity to attack and turn back the redcoats. Washington learned that British General William Howe had moved about 9000 redcoats to an outlying town called Germantown, which is now part of the City of Philadelphia. On this date in 1777, General George Washington and about 11,000 members of the Continental Army boldly attacked Howe’s encampment at Germantown. While fog and inexperience hampered the Continental Army, they attacked the redcoats with passion. Gen. Anthony Wayne’s troops were especially passionate because they saw this battle as an opportunity to take revenge on the British for the Paoli Massacre of September 20-21. Cries of “Remember Paoli” and “Avenge Wayne’s Affair” rang out. There was a vicious battle at the Benjamin Chew mansion called Cliveden House. The patriots sustained more casualties than the British (152 patriots killed to 71 redcoats, 521 patriots wounded to 71 redcoats) and had to retreat, but the young army’s bravery in this battle was one reason that the French decided to lend more support to the Continental Army. 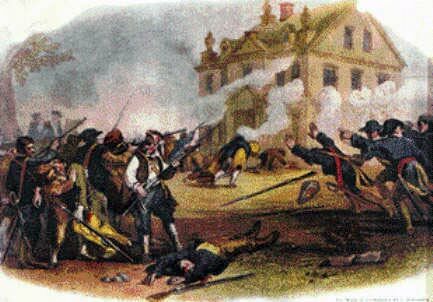 Every year, this battle is reenacted at the site of the Cliveden House, Germantown Avenue and Cliveden Street in Germantown, Philadelphia, Pa. This entry was posted in Uncategorized on October 4, 2016 by Sheilah Vance. twice at Germantown. I dont know much more than that. would be appreciated. Thanks for your time.